With absolutely no exaggeration, Korean sheet masks changed our lives. Gone were the days of your mud mask rubbing off on your clothes, your hair, your fingers—hey, beauty can be messy. Plus, the sheet created a shield that ensured deeper penetration of ingredients, giving us totally perfect skin. Well, prepare to step up your skincare game, because there’s a new mask in town: rubber sheet masks. A Korean salon staple for over ten years, they’re finally making their way stateside. 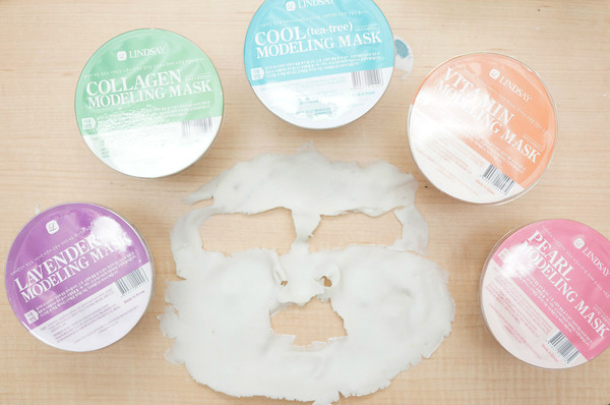 Also known as “modeling masks” because they’re similar to putty used to create artwork, the formulas include alginate, an ingredient derived from kelp. “It congeals when in contact in water,” says Christine Chang, the co-founder of Glow Recipe, and our go-to Korean skincare expert. While we have a tendency to strip oil away in our skin care routines, Koreans focus on securing hydration. That means that these masks cleanse, but very gently. They don’t feel overly heavy during the ten minutes of wear. Your skin still has the freedom to breathe. When the masks are removed by peeling, the skin underneath is brighter and more supple. Our tester saw immediate results that lasted for two full days. One downside: there is some mixing involved; these aren’t your on-the-go masks. At-home versions, like Lindsay’s Rubber Modeling Masks ($6, glowrecipe.com), come in pre-dosed cups where you add water—a line on the cup designates how high to fill—mix and then apply to the face with an included spatula. But compared to the time facialists spend in Korean spas measuring and mixing, the at-home versions are quick and self explanatory. We had no problem following the instructions, nor in sitting still for the fifteen minutes it took to mix, apply, enjoy the benefits of, and remove the Korean rubber mask. Pro tip: When you apply the paste to your face, make sure to paint the sides thicker so it peels off easier, says Chang. With enough practice, you can even peel it off in one piece.